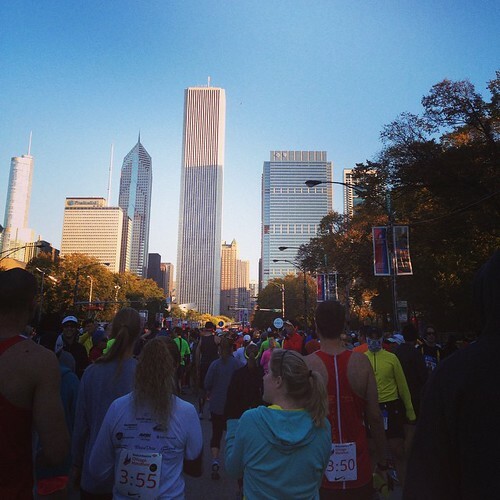 Confession time - I never intended to run the Chicago Marathon. I had an impression of this race – running in a sea of people where you really have to pay attention to the people around you to prevent getting stomped on (or stomping on someone), and it felt stressful. Reading the course description (run along the lake, through Lincoln Park, through the ethnic communities, ending in Grant Park), sounded wonderful, but would I be able to enjoy it, or would I be fixated on the back of the person in front of me? With the exception of miles 19 - 23, where cramps in my right calf forced me to alternate between walking and running, I had a great run. I never felt crowded in, even at the start, and the course wound beautifully through Chicago, showcasing its eclectic architecture, waterways, parks, neighborhoods and most importantly, the infectious spirit of the people who make up the city. The crowds exuded energy that resulted in an inexplicable electric in the air. That energy has the power to carry you through the depths of nothingness - perfect for those hard miles towards the end of a marathon. Scott and I arrived Saturday afternoon and navigated the labyrinth of the race Expo before heading to our hotel. Of course the traffic was terrible - with 45,000 runners and their families / friend descending upon the already crowded city, we needed to be patient and plan for numerous delays. I opted to book the Chicago Hilton on Michigan Ave, right across from Grant Park and the Start / Finish Line. Because the last thing I wanted was additional stress on race day. I made the right decision and will stay there again the next time I run this race (yes, I will come back). 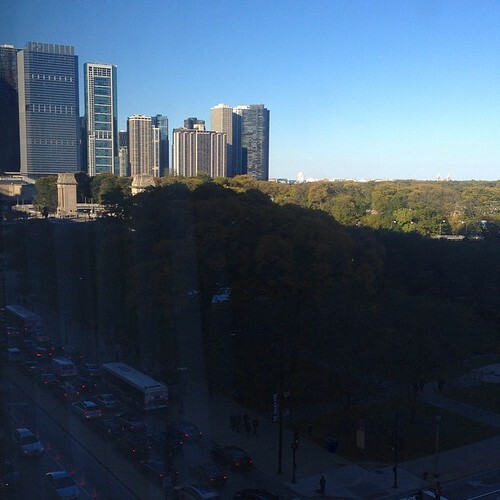 As a bonus, our room overlooked Michigan Ave and the park! We could see the Chicago skyscrapers to the north and Field Museum / Soldier Field to the south. After dinner (room service, because I wanted to keep off my feet), we walked north along Michigan Avenue to find Starting Gate 2, my assigned gate. I timed how long it would take so I could better plan for the next morning. I planned to leave the hotel as late as possible to minimize "standing around" time and to avoid having to use a porta potty at the start (super long lines). The marathon gates open up at 5:30 on race day. As I watched the sun come up, the streets below buzzed with people streaming towards the start line. I was able to stay in the room until 7:20 before heading out to my start corral. The weather couldn't be more perfect - 52degF at the start, clear, with a slight wind from the south. The start corrals were well organized and spacious. I never felt crowded in and found a spot on the curb where I could sit before we started moving towards the start line. Our corral was scheduled to start at 8:00 and I crossed the start line at 8:03. Again, I never felt crushed in, even at the start - I could run unfettered immediately at a comfortable pace. I have participated in several races where this was not the case, so I was pleasantly surprised. 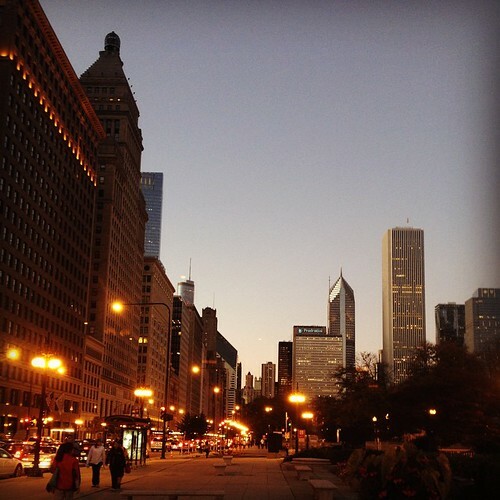 Highlights of the race course - running under the big skyscrapers of Chicago's "Loop", traversing the numerous Loop Bridges, running through Lincoln Park and the tree lined streets of the Historic Old Town. I was hurting when I ran through the tail end of the ethnic neighborhoods and the people there really buoyed my spirits. Between miles 19 and 20, I started to experience cramps that required me to alternate between running and walking. I walked / ran miles 19-23, and connected with another runner, Jeff, who was experiencing the same plight. He implored me not to stop and stretch - doing so might tear the muscles (I was starting to cramp in my thigh, too). By walking it out and taking extra gatorade at two aid stations, I was able to start running again before mile 24. My official time - 4:28:42. I was hoping for a PR - my left foot's plantar fasciitis was not a factor during the run - but I think my lack of activity these last two weeks set me back a little. I also underestimated the amount of sports drink / electrolytes I needed - the weather was perfect and I never outwardly got sweaty, wasn't really thirsty and didn't take gatorade at each aid station. Lessons learned for next time. This was such a great experience, all made possible by my friends and family. Congratulations! Sounds like a really nice course and interesting that it wasn't crowded. I guess I assumed all big-city marathons were really crowded. Great job too on using walk breaks to get you through the cramping and then running the last few miles. I had no idea you shouldn't stop and stretch for a cramp, so lesson learned for me too. Overall, it sounds like you ran a great race! Congratulations! So glad you had a great experience. I love the photos of the city with the lights on. A very big congratulations to you, Shirley!! I am so glad that it was a great experience for you. I was thinking of you and even this morning I wondered if you would post! You had a great run. I'm so glad the plantar didn't flare. I hope you aren't too sore today, but actually your body does deserve a few twinges. Good for you! I am so happy for you - it sounds like a very good experience - even with miles 19-23 (those are the miles that educate towards next time). I have often wondered when watching marathons/triathlons/various races, how people manage to not trample each other (especially when swimming is involved) - so glad this wasn't a factor. 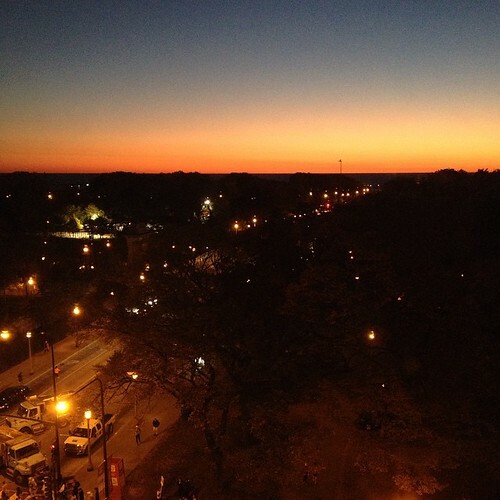 Your pictures of Chicago (especially the night/early morning ones) are wonderful. 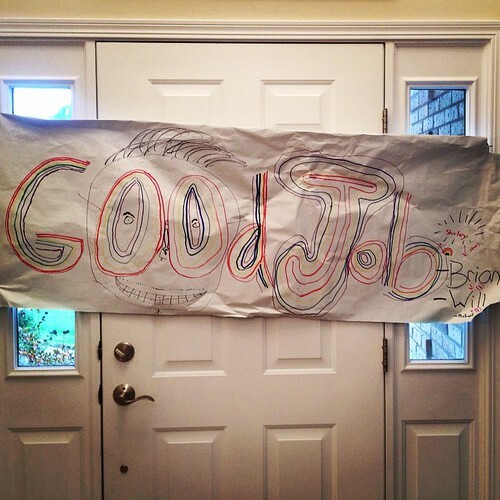 I am proud of you and that welcome home sign - perfect!